"Mailman" and "Postman" redirect here. For other uses, see Mailman (disambiguation) and Postman (disambiguation). An Australian postie riding a motorbike in Melbourne. A USPS van on Cambridge Street in Harvard Square (Cambridge, Massachusetts). 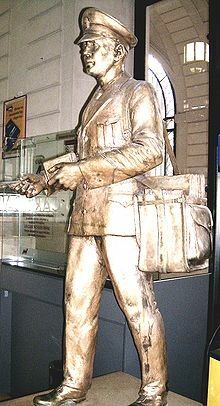 A mail carrier, mailman, mailwoman, postal carrier, postman, postwoman, or letter carrier (in American English), sometimes colloquially known as a postie (in Australia, New Zealand, Scotland, and other parts of the United Kingdom), is an employee of a post office or postal service, who delivers mail and parcel post to residences and businesses. The term "mail carrier" came to be used as a gender-neutral substitute for "mailman" soon after women began performing the job. In the Royal Mail, the official name changed from "letter carrier" to "postman" in 1883, and "postwoman" has also been used for many years. 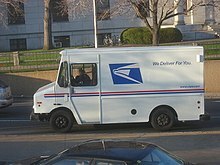 In the United States, there are three types of mail carriers: City Letter Carriers, who are represented by the National Association of Letter Carriers; Rural Carriers, who are represented by the National Rural Letter Carriers' Association; and Highway Contract Route carriers, who are independent contractors. While union membership is voluntary, city carriers are organized near 70% nationally. Letter carriers are paid hourly with the potential for overtime. Letter Carriers are also subject to "pivoting" on a daily basis. Pivoting (when a carrier's assigned route will take less than 8 hours to complete, management may "pivot" said carrier to work on another route to fill that carrier up to 8 hours.) is a tool postal management uses to redistribute and eliminate overtime costs, based on consultation with the Carrier about his/her estimated workload for the day and mail volume projections from the DOIS (Delivery Operations Information System) computer program. Routes are adjusted and/or eliminated based on information (length, time, and overall workload) also controlled by this program, consultations with the carrier assigned to the route, and a current PS Form 3999 (street observation by a postal supervisor to determine accurate times spent on actual delivery of mail). Highway Contract Routes are awarded to the lowest bidder, and that person then either carries the route themselves or hires carriers to fulfill their contract to deliver the mail. Letter carriers typically work urban routes that are high density and low mileage. These routes are classified as either "mounted" routes (for those that require a vehicle) or "walking" routes (for those that are done on foot). When working a mounted route, letter carriers usually drive distinctive white vans with the logo of the United States Postal Service on the side and deliver to curbside and building affixed mailboxes. Carriers who walk generally also drive postal vehicles to their routes, park at a specified location, and carry one "loop" of mail, up one side of the street and back down the other side, until they are back to their vehicle. This method of delivery is referred to as "park and loop". Letter carriers may also accommodate alternate delivery points in cases where "extreme physical hardship" is confirmed. Rural carriers typically work routes that have a lower density and higher mileage than those of letter carriers. They all work mounted routes, leaving their vehicles only to deliver to group mailboxes or to deliver an article that must be taken to a customer's door. However, now that former rural areas are being urbanized, their routes are growing very similar to mounted "city routes". Rural carriers often use their own vehicles and are not required to wear a uniform. Because of urbanization around cities and because rural carriers deliver mail at less cost to the Postal Service, the rural carrier craft is the only craft in the Postal Service which is growing. Highway Contract Route carriers work routes that were established with a density of less than one customer per mile driven (some later grow denser, and can then be converted to rural delivery). They are only mounted routes, and all HCR carriers use their own vehicle. These routes are typically found in outlying areas, or around very small communities. The three types of mail carriers are also hired quite differently. A new letter carrier begins as a City Carrier Assistant (CCA.) Rural carriers are hired as Rural Carrier Associate (RCA) carriers, without benefits. There is normally an RCA assigned to each rural route, so they usually work less frequently than city CCAs. As a result, there are thousands of RCA positions that go unfilled due to a lack of applicants, and are being covered by other RCAs until hiring improves for the hiring process explained). Highway Contract Route carriers are hired by the winning bidder for that route. They are not United States Postal Service employees, and normally receive lower pay than carriers on city or rural routes. Women have been transporting mail in the United States since the late 1800s. According to the United States Post Office archive, "the first known appointment of a woman to carry mail was on April 3, 1845, when Postmaster General Cave Johnson appointed Sarah Black to carry the mail between Charlestown Md P.O. & the Rail Road "daily or as often as requisite at $48 per annum". For at least two years Black served as a mail messenger, ferrying the mail between Charlestown's train depot and its Post Office." At least two women, Susanna A. Brunner in New York and Minnie Westman in Oregon, were known to be mail carriers in the 1880s. Mary Fields, nicknamed "Stagecoach Mary", was the first black woman to work for the USPS, driving a stagecoach in Montana from 1895 until the early 1900s. When aviation introduced airmail, the first woman mail pilot was Katherine Stinson who dropped mailbags from her plane at the Montana State Fair in September 1913. The first women city carriers were appointed in World War I and by 2007, about 59,700 women served as city carriers and 36,600 as rural carriers representing 40% of the carrier force. Peter Bonetti, English goalkeeper who played for Chelsea F.C. Ferdinand Cheval, who spent 33 years building an "ideal castle"
Ace Frehley, original guitarist for the rock band Kiss, worked as a mailman before he became the "Spaceman"
Kimeru, a famous Japanese pop singer, was a mailman before he pursued his singing career. Allan Smethurst, English singer known as "The Singing Postman"
Steve Taylor, a footballer who played for Crystal Palace F.C. Tom Tipper, from The Railway Series book Really Useful Engines, then season 4 of Thomas and Friends episode "Mind That Bike"
Wikimedia Commons has media related to Mail carriers. ^ "Can you deliver the goods?". Royal Mail. 2013. Archived from the original on 19 December 2011. Retrieved 15 February 2013. ^ "Keeping our posties safe". Australia Post. Retrieved 15 February 2013. ^ "Postie". New Zealand Post. 2009. Retrieved 15 February 2013. ^ "What did your relatives do?". London: British Postal Museum & Archive. Archived from the original on 18 January 2009. Retrieved 4 December 2009. ^ "NALC Facts & History - FAQ". Nalc.org. 28 January 2013. Archived from the original on 13 November 2013. Retrieved 25 December 2013. ^ "USPS DMM 508 Recipient Services". Pe.usps.gov. 3 July 1994. Archived from the original on 25 August 2006. Retrieved 25 December 2013. ^ "Contract Administration". NALC. Archived from the original on 27 November 2013. Retrieved 25 December 2013. ^ "Women Mail Carriers" (PDF). About.usps.com. June 2007. Retrieved 15 July 2015. ^ Drewry, Jennifer M. "Mary Fields a pioneer in Cascade's past". Cascademontana.com. Archived from the original on 29 July 2012. Retrieved 25 December 2013. ^ "Women Carriers" (PDF). About.usps.com. Retrieved 2 March 2009. ^ Historian USPS (June 2007). "History of Women Carriers" (PDF). Postal People. USPS. Archived from the original (PDF) on 8 May 2009. Retrieved 2 March 2009.